It’s no secret the UFC has not had a very good 2017. The promoter is going to close the year in a strong way, but 2017 will not reach the level of what the Octagon company offered in 2016. The drop in numbers can be attributed to many reasons, but one of the main causes is certainly the lack of stars that generate good Pay-Per-View sales. Ronda Rousey moved away from the competition after losing to Holly Holm and Amanda Nunes. And the date for the return of Conor McGregor is uncertain despite the fact that the same Irishman promised to return to the MMA after his loss to Floyd Mayweather Jr.in August of this year. After a break of 4 years, Georges St-Pierre returned on November 4 with a triumph for submission over Michael Bisping and became Middleweight Champion, but we will have to see if it will generate the huge numbers of PPV that achieved when I was welterweight champion. 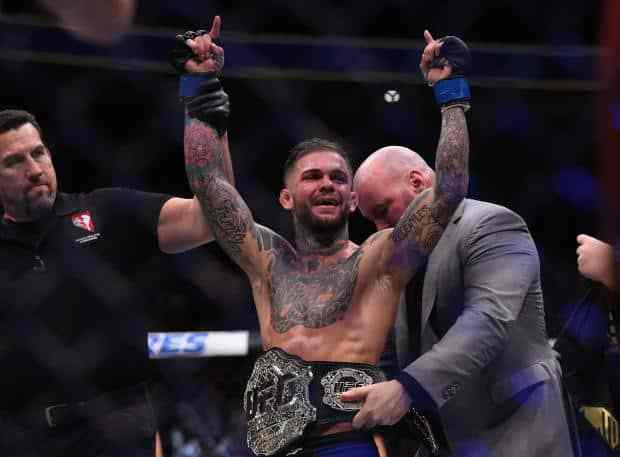 Cody Garbrandt – one of the pillars of Team Alpha Male – is one of the most exciting young people in the sport. With only 26 years, ‘No Love’ has accumulated 11 wins, of which 9 have been through the KO / TKO. In addition, his most recent victory was against the legendary Dominick Cruz, who snatched the bantamweight belt of the UFC. Cody lost his belt after being knocked out by TJ Dillashaw at UFC 217, an event held on November 4th, but Garbrandt is young and we will surely see him at some point to dispute the title.